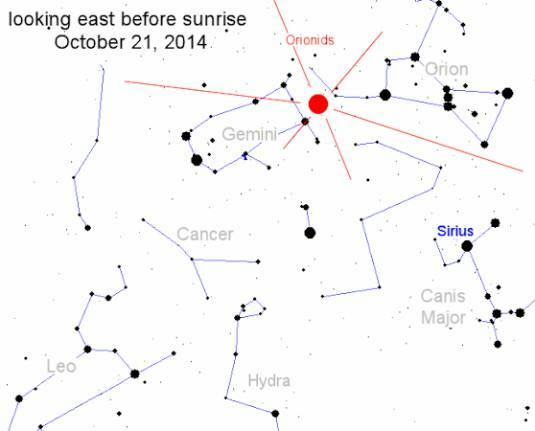 Vid If you're in a position to see the constellation of Orion tonight then it's time to enjoy the annual Orionid meteor shower – as the Earth slams into the debris left by Halley's Comet's 1986 visit at about 148,000 MPH. "The Orionid meteor shower is not the strongest, but it is one of the most beautiful showers of the year," said Bill Cooke, the head of NASA's Meteoroid Environment Office. "We expect to see about 20 meteors per hour when the shower peaks on Tuesday morning, October 21. With no Moon to spoil the show, observing conditions should be ideal." The Moon will still be there, of course; however, it's only three days from it's darkest period. If you are anywhere dark, and away from light pollution, the evening's performance of Halley's fireworks show could be quite something. In between shooting stars you can gaze at the glories of the Dog Star Sirius, the planet Jupiter, and the constellations of Gemini, Taurus, and Orion – which gives the shower its name. The river of material that ablates from Halley's Comet hits our atmosphere so fast that most of the exfoliated gunk flares up and burns out at the sudden temperature rise. The actual size of the debris left by our three-quarter century cometary visitor is pretty small, so there's no need to panic, NASA says, although a small rock or two may make it down to the surface as a meteorite. Tuesday will be the peak of the annual show, but Earth will still be picking out outliers later that night, so all is not lost if it's cloudy where you are: you should be able to see the fireworks wherever you are between midnight and dawn.